The heart and soul of our company is our year round garden center, conveniently located on Highway 54 in La Harpe, KS. 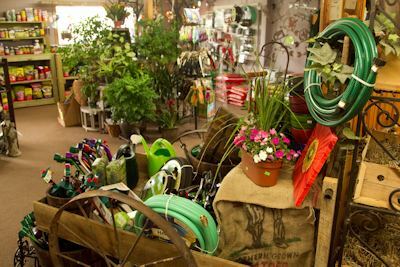 Inside our doors, you will find everything you need for a successful gardening season. Garden seed, onions, and potatoes start filling the bins in early spring, ready to be taken home by the next eager gardener. TLC carries a fine selection of chemicals and amendments to help your garden along. Also inside is our gift shop full of garden accessories, fountains, and pottery of all shapes, sizes, and colors, ready to be filled with the perfect plants from our greenhouses. Outside you will find a wide array of shade trees, fruit trees, and shrubs. Once in the greenhouse, you will be welcomed with a rainbow of colorful annuals, hanging baskets and perennials. The majority of our vegetables are started by us from seed and we are proud to have the best plants around. Our concrete pathways and carts make shopping a breeze and our helpful staff will assist you if any questions or needs arise. TLC also has bulk landscape materials such as topsoil, mulch, and river rock. These items can either be loaded into your truck or delivered directly to your project for a small fee. One of our favorite times of the year is autumn, with the cooler weather and beautiful fall foliage. TLC has fall garden mums in variety of colors and sizes, along with pansies, flowering kale, spring bulbs, and garden vegetable seed. In the winter, TLC becomes a Christmas wonderland, full of fresh cut Christmas trees, wreaths and dazzling Christmas decorations and gifts throughout our gift shop.